In 2019, what area are you “making space” for? My vision board is important to me because it includes images and quotes of what I want to accomplish and implement in my day to day life. I am a visual learner, so I felt that a vision board would help me map out my goals. 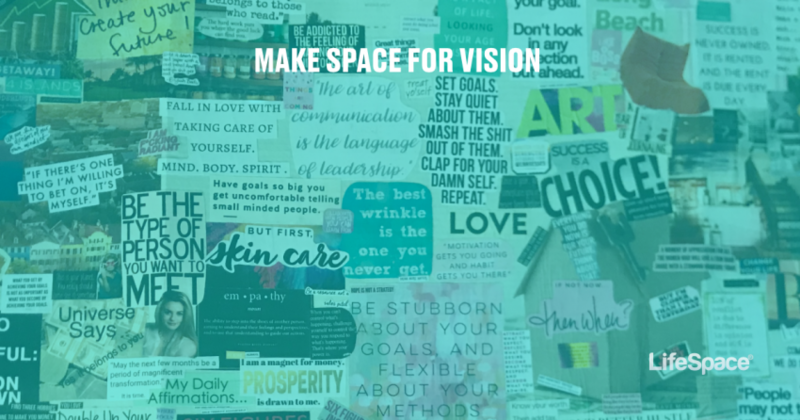 Without my vision board, I felt like I would forget some of the goals I want to achieve. My vision board allows me to focus on the main themes of my life: travel, skin care, fitness, career advancement and purchasing real estate. What do I want to accomplish this year? In the next 5 Years? How do you use LifeSpace to achieve your goals personally and professionally? I want to use LifeSpace to help me implement a plan of action with my vision board. I like the ability to access all my goals and track my progress accurately. I would be able to record my personal goals, such as skin care and traveling as well as my professional goals, career advancement and buying real estate. LifeSpace can help me make more space in my life to follow through with what I envision for my future. Having all my goals in one place allows me to stay accountable. I would love to connect and network with others that have similar goals!